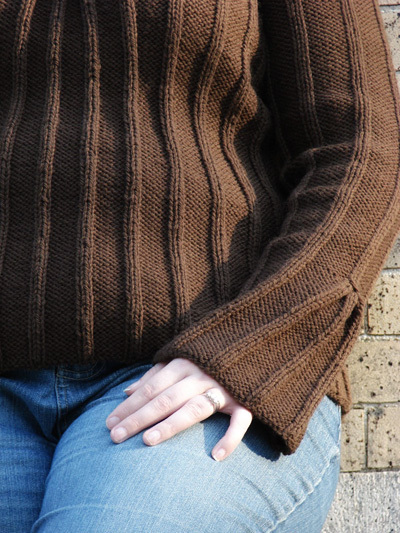 Renaissance began with a simple pleat swatched in Classic Elite's Renaissance yarn. I carried this swatch around in my pocket for a few days mulling over what it would become. Ideas came and went, until finally (after a few more swatches) the right combination of pleats and decreases took shape into the sweater you see here. Pleats are a lot of fun and they're my favorite part of this design. Pleats can add a touch of interest, while also decreasing lots of stitches at once. As fun as pleats are to me, I didn't want to overdo them. 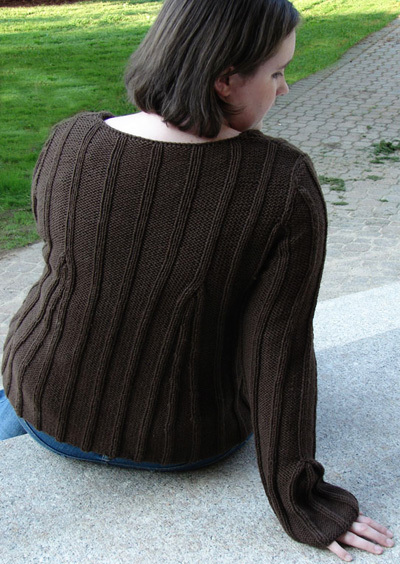 On the back of the sweater there are two dart-like decreases designed to mimic the look of the front pleat, but without creating any bulky fabric, and still maintaining the same style. The A-line shape is flattering for many many sizes and shapes, so the pattern is written for a range of sizes. 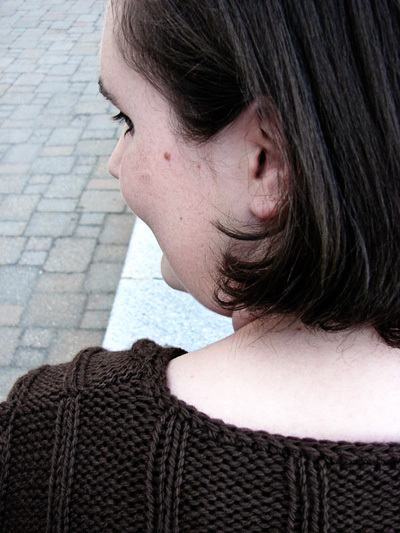 Knitty's editor, Amy, asked if I could knit the model garment to show how beautifully it flatters the contours of a curvy woman. w2tog: If the second st on the left needle is a k st, work k2tog; if it is a p st, work p2tog. ssw: If the next st on the left needle is a k st, work ssk; if it is a p st, work ssp. Row 1 [RS]: K2, [p6, k2] to end. Row 2 [WS]: P2, [k6, p2] to end. Repeat these 2 rows for 2x6 Rib. CO 98 [106, 114, 122, 130, 138, 146] sts. Row 1 [RS]: P0[4, 0, 4, 0, 4, 0], work in 2x6 Rib to last 0[4, 0, 4, 0, 4, 0] sts, p0[4, 0, 4, 0, 4, 0]. Row 2 [WS]: K0[4, 0, 4, 0, 4, 0], work in 2x6 Rib to last 0[4, 0, 4, 0, 4, 0] sts, k0[4, 0, 4, 0, 4, 0]. These 2 rows set pattern for back. Continue in pattern until work measures 3.25[3.5, 3.75, 3.75, 4, 4.25, 4.5] inches, ending with a RS row. Set-up Row [WS]: Work 17[21, 25, 29, 33, 37, 41] sts in pattern, place marker, work 8 sts in pattern, place marker, work 48 sts in pattern, place marker, work 8 sts in pattern, place marker, work remaining 17[21, 25, 29, 33, 37, 41] sts in pattern. Next Row [RS]: Work in pattern to second marker, slip marker, ssk, work in pattern to 2 sts before third marker, k2tog, work in pattern to end. Work 5 rows in pattern as set. Next Row [RS]: Work in pattern to first marker, slip marker, ssk, work in pattern to 2 sts before fourth marker, k2tog, work in pattern to end. Repeat these 12 rows 4 times more. 78[86, 94, 102, 110, 118, 126] sts. Row 1 [RS]: Work in pattern to second marker, remove marker, ssk, work in pattern to 2 sts before third marker, k2tog, remove marker, work in pattern to end. 76[84, 92, 100, 108, 116, 124] sts. Rows 2, 4, 6 [WS]: Work all sts in pattern as set. Row 3 [RS]: Work in pattern to first marker, slip marker, ssk, p1, k2tog, work in pattern to 5 sts before last marker, ssk, p1, k2tog, work in pattern to end. 72[80, 88, 96, 104, 112, 120] sts. Row 5 [RS]: Work in pattern to 1 st before first marker, ssk, removing marker and replacing it after ssk; k2tog, work in pattern to 3 sts before last marker, ssk, move marker to after ssk just worked, k2tog, work in pattern to end. 68[76, 84, 92, 100, 108, 116] sts. Row 7 [RS]: Work in pattern to 1 st before first marker, k2tog, removing marker; work in pattern to 1 st before last marker, ssk, removing marker, work in pattern to end. 66[74, 82, 90, 98, 106, 114] sts. Continue in pattern until work measures 15[15.25, 15.5, 15.5, 15.75, 16, 16] inches or desired length to underarm, ending with a WS row. BO 4[4, 4, 4, 4, 6, 6] sts at beginning of next 2 rows. 58[66, 74, 82, 90, 94, 102] sts. Note: See Pattern Notes for abbreviations w2tog and ssw. Decrease Row 1 [RS]: K2, w2tog, work in pattern to last 4 sts, ssw, k2. Decrease Row 2 [WS]: P2, ssw, work in pattern to last 4 sts, w2tog, p2. Repeat these 2 rows 0[0, 1, 1, 2, 2, 2] times more. 54[62, 66, 74, 78, 82, 90] sts. Repeat these 2 rows 0[2, 2, 5, 5, 5, 8] times more. 52[56, 60, 62, 66, 70, 72] sts. Continue in pattern until work measures 7.5[7.75, 8.25, 8.75, 9.25, 9.5, 9.75] inches from beginning of underarm, ending with a WS row. In the next row, work is divided for neckline. After work is divided, right and left sides are worked at the same time; directions for the two sides are divided by a semi-colon. Next Row [RS]: Work 16[17, 18, 19, 20, 21, 22] sts in pattern, join another ball of yarn and BO 20[22, 24, 24, 26, 28, 28] sts, work in pattern to end. 16[17, 18, 19, 20, 21, 22] sts for each shoulder. Row 1 [WS]: BO 6[7, 5, 5, 6, 5, 5] sts, work in pattern to end; BO 4 sts, work in pattern to end. Row 2 [RS]: Work as for Row 1. 6[6, 9, 10, 10, 12, 13] sts remain for each shoulder. Row 3 [RS]: BO remaining 6 sts; work all sts in pattern. Row 4 [WS]: BO remaining 6 sts. Row 3 [WS]: BO 5 sts, work in pattern to end; work all sts in pattern. Row 4 [RS]: Work as for Row 3. -[-, 4, 5, 5, -, -] sts remain for each shoulder. Row 5 [RS]: BO remaining sts; work all sts in pattern. Row 6 [WS]: BO remaining sts. Row 3 [WS]: BO -[-, -, -, -, 4, 5] sts, work in pattern to end; work all sts in pattern. Row 4 [RS]: Work as for Row 3. 8 sts remain for each shoulder. Row 5 [WS]: BO 4 sts, work in pattern to end; work all sts in pattern. Row 6 [RS]: Work as for Row 5. 4 sts remain for each shoulder. Row 7 [RS]: BO remaining 4 sts; work all sts in pattern. Row 8 [WS]: BO remaining 4 sts. CO 82[90, 98, 106, 114, 122, 130] sts. Continue in pattern until work measures same as back to underarm, ending with a RS row (1 row less than for back). Next Row [WS]: Work 31[35, 39, 43, 47, 51, 55] sts in pattern, place marker, work 20 sts in pattern, place marker, work remaining 31[35, 39, 43, 47, 51, 55] sts in pattern. Beginning on next row, work armhole shaping as for back, while AT THE SAME TIME shaping neckline as follows. In the next row, front pleats are formed. Pleat Row [RS]: Work in pattern to first marker, slip 3 sts to a double-point needle and hold to front of work; slip 3 sts to a second double-point needle and rotate this needle 180 degrees clockwise, so that the sts sit directly behind the sts on the first double-point needle and directly in front of the next 3 sts on the left needle; p together first st from each of the three needles, k together next st from each needle, then k together last st from each needle; k2 from left needle; slip 3 sts to a double-point needle and hold to back of work; slip 3 sts to a second double-point needle and rotate this needle 180 degrees counter-clockwise, so that the sts sit directly behind the next 3 sts on the left needle and directly in front of the sts on the first double-point needle; k together first st from each of the three needles, k together next st from each needle, then p together last st from each needle; work in pattern to end. 8 sts remain between markers. Dividing Row [RS]: Work in pattern to 1 st before first marker, ssp, removing marker, slip 2 sts to double-point needle and hold to front of work, slip next 2 sts to double-point needle and hold to back of work, k2 from left needle, p1 from needle at back of work; join a new ball of yarn and p1 from needle at back of work, k2 from needle at front of work, p2tog, removing marker, work in pattern to end. Next Row [WS]: Work in pattern to 3 sts before end of first side, place marker, p3; sl 2 sts purlwise with yarn held to front of work, p1, place marker, work in pattern to end. On RS rows: work to first marker, k3; sl 2 sts purlwise with yarn held to back of work, k1, work to end. On WS row: work to first marker, p3; sl 2 sts purlwise with yarn held to front of work, p1, work to end. Neckline Decrease Row [RS]: Work in pattern to 2 sts before marker, ssw, slip marker, k3; sl 2 sts purlwise with yarn held to back of work, slip marker, w2tog, work in pattern to end. 1 st decreased each side. Repeat these 2 rows 2[4, 3, 2, 2, 2, 2] time(s) more. Repeat these 4 rows 7[6, 8, 9, 11, 11, 11] times more, then work Neckline Decrease Row once more. 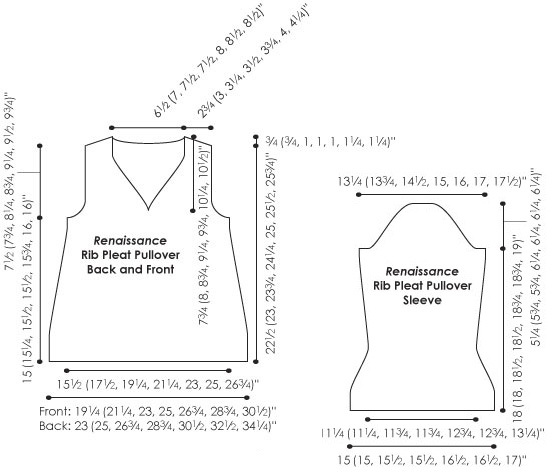 When all neckline and armhole decreases have been worked, 15[16, 17, 18, 19, 20, 21] sts remain for each shoulder. When work measures same as back to beginning of shoulder shaping, shape shoulders as for back (do not BO 4 sts at neckline edge as for back). 3 sts remain at neckline edge of each shoulder. Place sts on st holders or waste yarn. CO 64[64, 66, 66, 70, 70, 72] sts. Row 1 [RS]: P7[7, 0, 0, 2, 2, 3], work in 2x6 Rib to last 7[7, 0, 0, 2, 2, 3] sts, p7[7, 0, 0, 2, 2, 3]. Row 2 [WS]: K7[7, 0, 0, 2, 2, 3], work in 2x6 Rib to last 7[7, 0, 0, 2, 2, 3] sts, k7[7, 0, 0, 2, 2, 3]. Continue in pattern until work measures 6.5 inches, ending with a RS row. Next Row [WS]: Work 22[22, 23, 23, 25, 25, 26] sts in pattern, place marker, work 20 sts in pattern, place marker, work remaining 22[22, 23, 23, 25, 25, 26] sts in pattern. Work Pleat Row as for Front. 52[52, 54, 54, 58, 58, 60] sts. Work 1 row in pattern as set. Next Row [RS]: Work in pattern to first marker, remove marker, p1, slip 2 sts to a double-point needle and hold to front of work, slip next 2 sts to a double-point needle and hold to back of work; arrange needles so that sts on first double-point needle are directly in front of next 2 sts on left needle, and sts on second double-point needle are directly behind; [k together next st from each needle] twice, p1, remove marker, work in pattern to end. 48[48, 50, 50, 54, 54, 56] sts. Increase Row [RS]: Work 1 st in pattern, m1, work in pattern to last st, m1, work last st in pattern. 50[50, 52, 52, 56, 56, 58] sts. Work 17[13, 11, 9, 9, 7, 7] rows in pattern, working increased sts into pattern and maintaining edge sts in reverse stockinette st. Work Increase Row. Repeat these 18[14, 12, 10, 10, 8, 8] rows 2[1, 1, 2, 2, 2, 2] times more. 56[54, 56, 58, 62, 62, 64] sts. Work -[11, 9, 7, 7, 5, 5] rows in pattern, working increased sts into pattern. Work Increase Row. Repeat these -[12, 10, 8, 8, 6, 6] rows -[1, 2, 2, 2, 4, 4] times more. -[58, 62, 64, 68, 72, 74] sts. Continue in pattern until work measures 18[18, 18.25, 18.5, 18.75, 18.75, 19] inches or desired length to underarm, ending with a WS row. BO 4[4, 4, 4, 4, 6, 6] sts at beginning of next 2 rows. 48[50, 54, 56, 60, 60, 62] sts. Note: When shaping sleeve caps, maintain 2 sts at each edge in stockinette st.
Repeat these 2 rows 0[0, 1, 1, 2, 2, 2] times more. 44[46, 46, 48, 48, 48, 50] sts. Work Decrease Row 1. Work 1 WS row in pattern. Repeat these 2 rows 3 times more. 36[38, 38, 40, 40, 40, 42] sts. Repeat these 4 rows 1[1, 0, 1, 0, 0, 0] times more. 32[34, 36, 36, 38, 38, 40] sts. Repeat these 2 rows 4[5, 6, 6, 7, 7, 6] times more. 22[22, 22, 22, 22, 26] sts. Repeat these 2 rows 0[0, 0, 0, 0, 0, 1] time more. 18 sts. BO 4 sts at beginning of next 2 rows. BO remaining 10 sts. Weave in ends and block pieces to measurements shown in schematic. Sew shoulder seams. Sew sleeves into armholes. Sew sleeve seams and side seams. Slip last picked-up st of back neckline to end of double-point needle. Using another double-point, k2 from double-point needle, k2tog tbl (last st from front neckline edging worked together with picked-up st). *Do not turn work. Slide sts on double-point needle to beginning of needle (right end of needle) and slip next picked-up st to end (left end) of needle. Pull yarn tightly at back of work, k2, k2tog tbl. Repeat from * until all picked-up sts have been worked. Graft sts of back neckline edging to held sts of right front neckline edging. Weave in remaining ends. 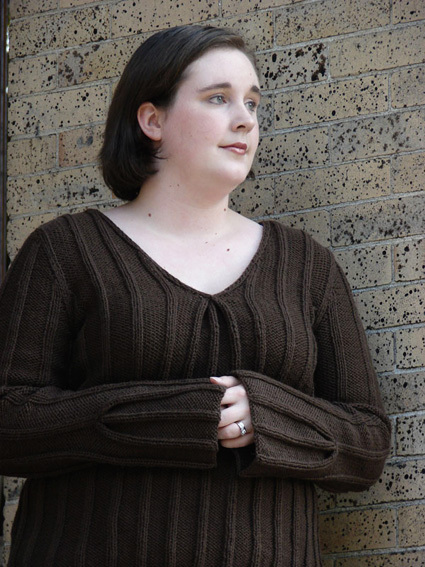 Kristen TenDyke is a knit and crochet designer and technical editor from Massachusetts. Her designs can be found in various well-known publications such as Vogue Knitting, Interweave Knits, Interweave Crochet, Knit Simple, Classic Elite’s pattern collections and more. 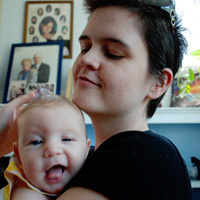 Kristen has a BFA in Graphic Design from Massachusetts College of Art and Design which she uses working at Classic Elite Yarns and which comes in handy when self publishing designs on her website. Pattern & images © 2009 Kristen TenDyke. Contact Kristen here.